I’m a Color Challenge Guest Designer over at Splitcoaststampers this month. The colors this week are Rich Razzleberry, Old Olive and Soft Suede; and for dessert…make a “thank you” or “Thanksgiving themed card. Played with some canvas resist fabric from Prima today. I first stamped the Penny Black “Charming” image in black archival ink and dried it with my heat gun. Then I added color with Prima Berry Wine Color Bloom, as well as Peeled Paint and Brushed Corduroy Distress Inks. Again, I dried that thoroughly with my heat gun. Next, the edges were distressed with a distressing tool and more ink and I added bits of Peeled Paint Distress Stickles to the leaves. The sentiment was stamped in archival ink onto some tissue paper and adhered to the card with some matte gel medium. I left some of the edges lifted to add to the “distressed” feel of the card. So beautiful! 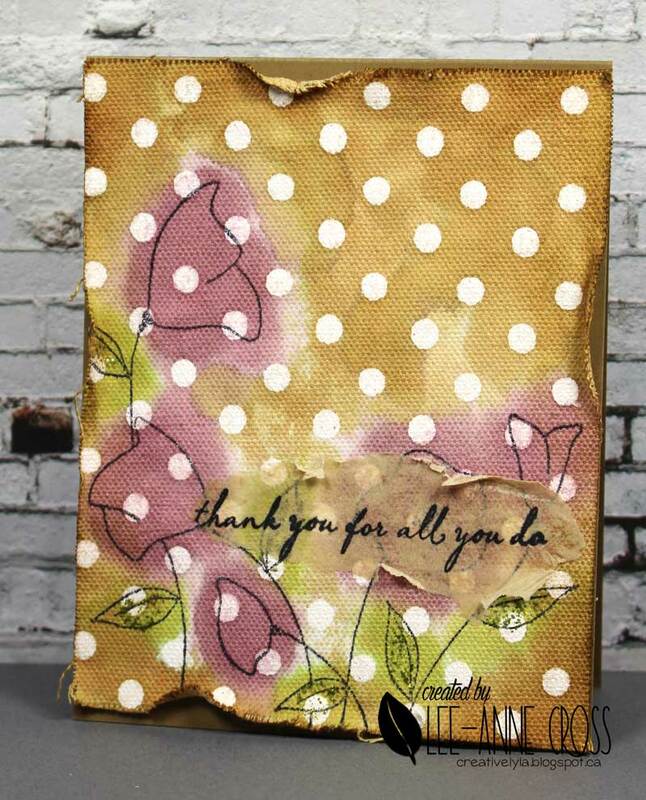 Love those distressed edges and those fabulous white polka dots. Fabulous! I love the muted colour scheme against the white resist polkadots. wow… your card is just gorgeous!! an absolute work of art! !